Mahindra Electric, part of the diversified US$19 billion Mahindra Group and a pioneer in the development and production of electric vehicles (EVs) in India, recently launched a Virtual Reality (VR) based drive experience for its smart and connected all electric vehicle, the e2oPlus. The experience, enabled through VR headsets, highlights the technical features and focuses on the key attributes of the e2oPlus. One of the main objectives of this initiative is to innovatively communicate all the technologically advanced features packed into the e2oPlus through an immersive experience of the vehicle, at select Mahindra dealerships. The campaign aims to expand the base of people who can experience electric mobility first hand, as well as delivering an advanced test drive experience to enable the faster adoption of EVs. 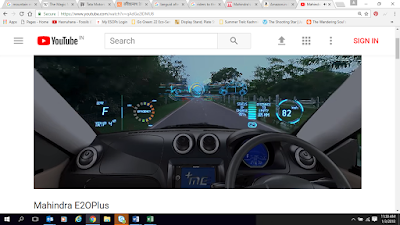 The Virtual Reality based drive experience for the e2oPlus is currently available at select Mahindra dealerships https://www.mahindrae2oplus.com/pages/support/dealer-locator. The same is also delivered to customers before a door step test drive, which can be booked on the Mahindra e2oPlus website https://www.mahindrae2oplus.com. The 2D, 360 degree version of the experience is also available on YouTube: https://www.youtube.com/watch?v=qAdGe2lDMU8 (best viewed in 4K quality). However the best way to experience the drive is through VR headsets and it can be enabled via apps available on Android and iOS.